The first commemorative stamps of Finland appeared in 1927, to celebrate the anniversary of the young republic's independence from Russia. Other commemorative stamps of the period from 1927 to 1934 celebrate Finnish history, Finnish postage stamps, and famous Finnish people. The two commemorative stamps shown above, at the left (Sc. #141-142), were issued on December 6, 1927 to celebrate the 10th Anniversary of Finnish Independence. The common design features the Coat of Arms of Finland, and the sides of the stamps are inscribed "19-VI-XII-17 / 19-VI-XII-27". The two overprinted definitive stamps shown above, at the right (Sc. #153-154), were issued on November 10, 1928 to celebrate the Helsinki Philatelic Exhibition, held from November 10 to November 18, 1928. The overprint reads "Postim[erkki] näytt[ely] / 1928 / Frim[ärke] utställn[ing]", meaning "Postage Stamp Exhibition (in Finnish) / 1928 / Postage Stamp Exhibition (in Swedish)". These two stamps were only sold at the exhibition, and they were only valid for postal use during the exhibition. 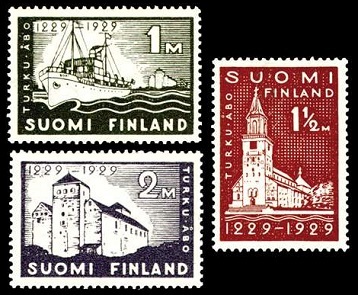 The three pictorial commemorative stamps of Finland shown above (Sc. #155-157) were issued on May 22, 1929 to celebrate the 700th Anniversary of the Founding of the City of Turku - Abo. 1.00 M. - S. S. Bore I leaving the harbor at Turku. The S. S. Bore I was originally constructed in 1898. The steamship provided transport for passengers and cargo between Turku, Helsinki, and Stockholm. 1.50 M. - Turku Cathedral. The cathedral is the principal church of the Evangelical Lutheran Church of Finland, and it is the seat of the Archbishop of Finland. The cathedral was originally constructed of wood, but over the centuries, it has been expanded using stone as the construction material. 2.00 M. - Turku Castle. The castle was begun, as a fortress, in 1280, at the time much of Finland was part of Sweden. It is the largest surviving Medieval building in Finland. Turku (Finnish) - Abo (Swedish) is a city on the Southwest coast of Finland, at the mouth of the Aura River. Turku is the oldest city in Finland, and for hundreds of years, as a commercial seaport, it was the most important city of Finland. The word "turku", in Finnish, means "marketplace". The two pictorial commemorative stamps of Finland shown above (Sc. #180-181) were issued on January 1, 1931 to celebrate the 100th Anniversary of the Finnish Literature Society. The two designs are as follows. 1.00 M. - Elias Lönnrot. 1.50 M. - Seal of the Finish Literature Society. The Finnish Literature Society, in Helsinki, was founded in 1831 to promote literature written in the Finnish language. One of its first publications was the "Kalevala", the Finnish national epic. Elias Lönnrot (1802-1884) was a Finnish physician and a collector of Finnish oral poetry. He created "Kalevala" in 1835, based on traditional ballads and lyric poems about Finnish mythology that he documented during his travels. The two pictorial commemorative stamps of Finland shown above (Sc. #182-183) were issued on February 28, 1931 to celebrate the 75th Anniversary of the First Postage Stamps of Finland. 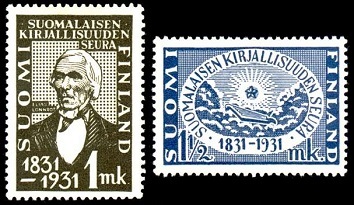 The two stamps feature the central designs of the 5 K. and 10 K. denomination stamps of 1856, along with the inscriptions "SUOMI / FINLAND" and "1856 / 1931". The 2 M. denomination commemorative stamp shown above, at the left (Sc. #197), was issued on December 15, 1931 to celebrate the 70th Birthday of President Svinhufvud. Pehr Evind Svinhufvud af Qvalstad (1861-1944) was a Finnish lawyer, judge, and politician, and he played a major role in the movement for Finnish independence. He served as the Prime Minister of Finland from 1930 to 1931 and as the 3rd President of Finland from 1931 to 1937. The 2 M. denomination commemorative stamp shown above, at the right (Sc. #206), was issued on October 10, 1934 to celebrate the 100th Birthday of the Birth of Aleksis Kivi. Aleksis Kivi (1834-1872) was a Finnish author. He was one of the earliest authors of prose and lyrics in the Finnish language, and he is still considered one of the greatest of them all.